So Pop and I were on our way to DW's house for Christmas a couple of years ago. It was just us in the car and we were talking about all sorts of fun farm type stuff. We got on the subject of chickens and big eggs. When I said "..man I wonder how big an Alpaca egg can get?" I'll let that sink in...an Alpaca egg! So at this point, Pop didn't have the heart or desire to tell me about the flaw in my question. What a mean man...it wasn't until the next day at breakfast he busts me out and tells everyone the story! I now know the difference between an Alpaca and an Emu (what I thought that I was referring to). Here's a picture of both for your reference. 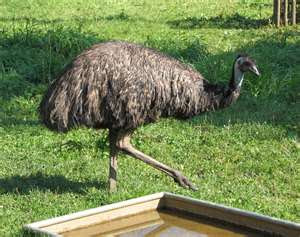 This is an Emu...they have eggs...really big ones as a matter of fact! 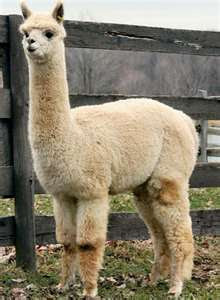 This is an Alpaca...They DON'T have EGGS! I'm sure Pop was wondering..."...how hairy would an Alpaca egg be?" I was supposed to be gone all weekend. I was headed to an adoption conference with two of my dear friends. I have been looking forward to it with great excitement. We were to leave on Thursday night. On Wednesday, Q started running a fever. By Thursday, I knew I would have to take him to the doctor. Turns out he has an ear infection. We got an antibiotic and headed home to snuggle. Also, Huckleberry got hit by a car. We think he got clipped in the face and rolled. He had a trip to the vet where they sedated him and determined that his jaw was broken. He was given meds and sent home to recover with special feeding instructions. We love big 'ol gentle Huck. We are so glad he is okay! I knew I just couldn't leave little Q and go to the conference. Those of you parents know that antibiotics often lead to diarrhea. I could just picture EJ trying to take care of an injured dog while cleaning up nasty baby poo poos and trying to chase all three boys. It just didn't feel right to leave. Turns out it is a very good thing I didn't go. By late Thursday afternoon I was in a bad way. A crazy sickness came over me in an instant. I had chills, aches, runny nose, sore throat and a fever. I felt like I couldn't lift my head from my pillow. Pop and Grammy helped me with the cowboys until EJ could get home that evening. Friday was spent just being sick. EJ kept the boys busy so I could rest. He did have to run to town a couple of times and it was all I could do to take care of the boys. The thing that freaked me out more than anything was the fever. I have read that fever in early pregnancy can be a bad thing. EJ called Dr. K's office. Nurse T told EJ that the fever was more dangerous to the babies than Tylenol. So we kept the Tylenol going and prayed the babies would hang tough through it all. My mother-in-law had been checking on us that day and wanted to keep the big boys for us for the night. We asked the boys if they wanted to go and of course they said yes. Saturday Q woke up with a rash all over his body and I was still miserable. We went to immediate care. Q was seen right away. He is allergic to the antibiotic he was given. They prescribed him a new one and told us to give him some benadryl. I waited another hour and forty-five minutes to be seen. The Dr. looked me over and said it was probably a virus. He told me to take Tylenol. I asked him if he would consider just cutting my head off. He didn't seem to think I was funny. When we called to check on the big boys, my in-laws informed us that Bubba woke up with a fever and had vomited that morning. Poor guy! They said he seemed to be doing better and was watching sports on TV with his Papa. We were headed to pick them up and go home. My mother-in-law insisted that we go on home and let them keep the boys another night. I was in no place to argue. I could hardly function. EJ had his hands full with me and Q. We came home and I slept and slept. When I woke up I asked EJ to go get the big boys. I was missing them. He called to check on them and they were having a good time and looking forward to staying another night. I didn't want to upset them. When I woke up this morning I finally felt human again. Certainly nowhere near 100% but better. This afternoon, EJ and Q went to pick up the big brothers. I was so happy when they made it home. We pulled out the hide-a-bed so we could all cuddle up and watch a movie. Pitiful aren't we? I cannot thank EJ enough for taking good care of us. I am also thankful for EJ's folks for keeping the big boys for us. I find it difficult to accept help but there are times when you just don't have a choice. I am so glad for family that steps in and saves the day when I need them. We got to hear the heartbeat...BOTH OF THEM!!! A few weeks ago we were shocked to find out that I was pregnant. After all, God hasn't given us another pregnancy since our little Wubba came. Q gave Pop and Grammy this card on Valentine's Day. We were thrilled but still shocked. Fast forward to our first Dr. appt. EJ and I were glad to see Dr. K. (He delivered Bubba and Wubba. He also delivered my niece SuperGirl and nephew SpiderMan). We laughed with Dr. K and our favorite nurse T. I told them that I was nervous to be there. I was still shocked and trying to believe that I was pregnant. When Dr. K prepared to do a sonogram I told him I was afraid he wouldn't find anyone in there. As he began to perform the sonogram I noticed the look on his face change. He said, "There are Two." "He's not kidding. EJ do you want your chair?" said Nurse T.
EJ to Me, "You were afraid there was no one in there. There is a whole dorm room in there!" We watched as Dr. K showed us each of their heartbeats. Both were at 120. It was amazing to hear the "thump thump" of each of their hearts. We couldn't wait to share the news!!! I texted my cousin to call me. I knew she was working that day. She called and I spilled my guts. She was so jazzed to hear the news! We quickly met EJ's folks for lunch. 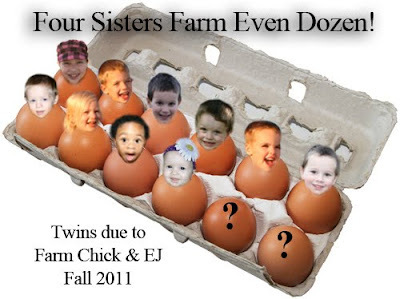 EJ showed them the sonogram and his Mom jokingly said, "there's one, there is another." EJ looked her and said, "You are right! There are two babies in there!" They were totally excited! Next we were headed home to tell Pop, Grammy and Pretty Princess. (Pretty Princess was at the Farm watching the cowboys for us). Grammy called me to check in on our appointment and to tell me that she and Pop were running some errands. We asked if we could meet them to show them a picture. We made plans to meet in a parking lot. While we waited for them I called DW and Rock Star. They couldn't believe it! I'm sure they thought we were kidding at first! When Pop and Grammy got there. I pulled out the sonogram pictures and said, "We got to hear the heartbeat...BOTH OF THEM!!!" Grammy jumped up and down in excitement. Pop looked a little shocked. We gave them a big hug and then headed home. When we arrived home I got to tell Pretty Princess and the cowboys at the same time. When I told the boys that there were two babies in my tummy they said, "That is silly!" 19 and to know this love that surpasses knowledge—that you may be filled to the measure of all the fullness of God. 20 Now to him who is able to do immeasurably more than all we ask or imagine, according to his power that is at work within us, 21 to him be glory in the church and in Christ Jesus throughout all generations, for ever and ever! Amen. "The tree" continues to capture my attention...and I'm not alone...the analogy of the first "Rooted and Established" post was not lost on some precious Four Sisters Farm blog followers. There is something so satisfying in knowing I am not alone in my affection for the way God shows Himself in creation. If we are watching and/or listening, there is a message for us. Check out Romans 1:20, "For since the creation of the world God’s invisible qualities—his eternal power and divine nature—have been clearly seen, being understood from what has been made, so that people are without excuse." We recently had some extremely dense fog around the farm and as I drove past "the tree" I was struck again. Pop and I have often found ourselves in two different types of fog in our lives together. Pop is a man who carefully considers options and thinks things through to their "logical conclusion." I am more spontaneous and likely to act out of emotion. We're a pretty good combo really...we've learned to listen to one another and I've learned a lot from Pop about thinking things through. He can be spontaneous too (much to my delight), but even when we do something crazy (like mudding with the go kart), he is safe. I love that about him! The second kind of F.O.G. is what we call the "Favor Of God." We first heard this phrase when we were preparing to move to Charleston, SC in 2005. After several years of waiting and watching God brought about the creation of the training academy where Pop would be a teacher and trainer of people who work in his field (and I don't mean the field at Four Sisters Farm). Looking back, we see very clearly that we have often been in this kind of F.O.G. even when we didn't recognize it. It is God Who gives us favor with men at times - maybe it is a job we really want, a move we hope to make, a house we would like to buy - you get the picture. If we are alert to God's movement in our lives, we see Him move on our behalf...opening doors, closing doors, bringing people and opportunities into our lives. It is a wonderful F.O.G. in which to be! Proverbs 3:3-4 says, "Let love and faithfulness never leave you; bind them around your neck, write them on the tablet of your heart. Then you will win favor and a good name in the sight of God and man." I hope that when you see fog in the future, you will be seeking God and asking for His favor as He directs your steps. He loves His children and wants only good for them (even when we can't see or feel it). Now that is good stuff! I am working on a post to tell you the whole story about the baby twins now growing in my tummy but I am all the sudden sick. Pretty sure it is the flu and not just preggo stuff. I will fill you in as soon as the aches and chills go away. God is good and grandchildren are such a blessing and a pleasure!! Good stuff! One night I was in the basement (long before Pop and Grammy were living with us and the basement was unfinished) fixing a power cord on the fireplace that the previous owners dogs had chewed to oblivion. I happened to also be talking on the phone to a buddy of mine while doing that. Farm Chick was working out and I was home alone with the cowboys. They were in bed and asleep. As I was working along, talking, I heard what sounded like a big plastic cup fall off the kitchen counter on to the floor...OH Farm Chick was home. So I told my buddy and headed up the front stairs. Got up to the kitchen and no one was there! So then all of a sudden it hit me...THERE COULD BE AN INTRUDER!!!! I had a knife from fixing that electrical cord, and I figured the guy headed down the back stairs, so I pursued with knife in hand, flashlight in hand, along with the phone still on (I wanted to have a witness if someone got hurt). While in route to the basement I picked up a rifle and so now I had the rifle in my left hand holding the knife like a bayonet along with the light because the basement was NOT very well lit. My heart was racing and the adrenaline was flowing like Niagara falls! I put the phone in my pocket (still on, again for protection). I started going through the basement room by room; just as I had seen all the great SWAT teams or cops or Jack Bauer do. However in my distress I started telling the intruder how unlucky he was and how horrible he was...this is the nice way of saying that I was screaming at the top of my lungs obscenities at him telling him to come out and I wouldn't shoot him or stab him (I didn't have any ammo....no time to grab that)! I made my sweep of the basement and alas to my delight there was NO ONE in our house that was there for nefarious intentions! WHEW! I gleefully picked back up the phone and told my friend that joyful news. He informed me that he had heard the whole thing and that I sounded ridiculous! who acts on behalf of those who wait for him." 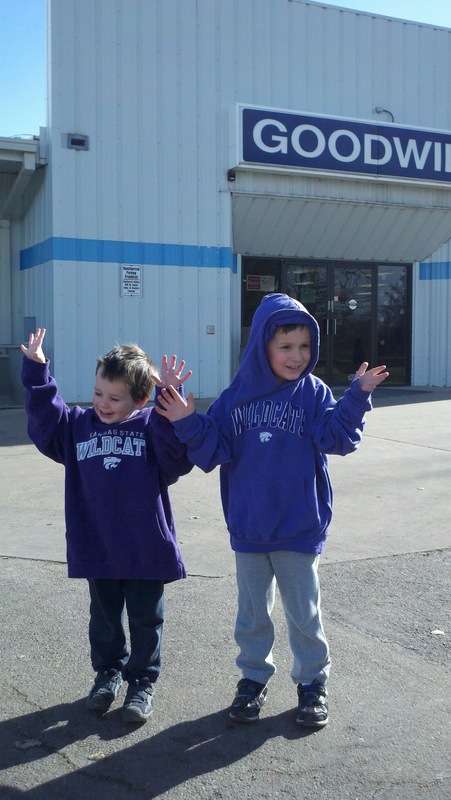 9 "However, as it is written: “What no eye has seen, what no ear has heard, and what no human mind has conceived” - the things God has prepared for those who love him—"
Lately, the boys have been obsessed with the Wildcats. They fight over who gets to sleep with my Wildcat blanket. They ask if they can go see a game. They love to hear us sing the fight song. They are my kind of boys! They went to run some errands with their Daddy this afternoon. A quick trip to the Goodwill and they were proud owners of K-State sweatshirts. Their precious faces were just beaming when they got home! I was sitting in the living room talking on the phone when I heard Mr. Q get into one of my cabinets in the kitchen. I decided that my conversation was more important than correcting him at that moment. How much damage could one 13 month old do in a few minutes? Never underestimate the power of the cowboy brotherhood. Big brothers stepped in and helped the baby to be most effective with his time. 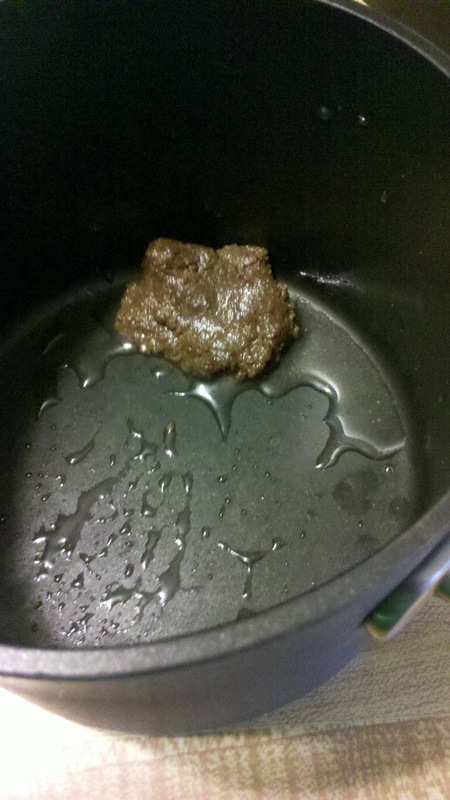 They quickly found the left over brownies and put them in my onion chopper. That makes sense, right? I e-mailed the following picture to EJ with the subject, "The boys made dinner for you." I often say to the boys, "Look at my face." When I am trying to get them to focus on what I am saying. Wubba to Bubba: "BUBBA, look at me! LOOK AT MY FACE!" Then while watching Despicable Me I realized that Miss Hattie used the line as well. Good heavens I hope I don't sound or look like Miss Hattie when I say that! Yikes. I have had a crazy sub sandwich obsession for nearly a year now. My sandwiches change. Right now, it is an oven roasted chicken breast sandwich with bacon and provolone cheese toasted with lettuce, tomato, onion and banana peppers with mayo. Was this important for you to know on this fine Wednesday morning? But I told you anyway. Do you have a favorite Subway sub? What is it? Maybe I'll try it sometime. Another useless fact...When it comes to eating out, I like to order the same things as my brother in law, PhoJo. He always picks the most tasty options. Considering how this is going to turn out. 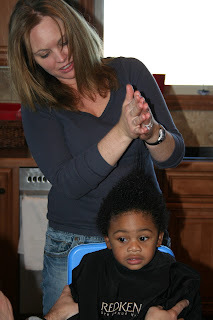 Aunt DW showing off Q's long hair! Still smiling at this point. There were a few tears and some pretty major frustration. At one point, Q looked upward as if to say, "Help me Jesus!" The good news...we have one happy big boy! A couple of weeks ago Farm Chick was making me help her move all the coats from one closet to another. At the back of the closet I just happened to find the coolest jacket EVER! OH yeah, you ladies can say it, and you guys can be jealous about it, he's a stud! If you remember you could only button the two bottom buttons, otherwise it had best be extremely cold or you were a loser! Also I was one of the really cool guys who happened to letter his freshman year in the fall, so my parents got me my letter jacket for Christmas! That means, that I got the most use out of it as possible!! WAHOO! Again, what a stud was I and am I still!?!?!!! So, when we were kids, Rock Star was pretty scrawny. I outweighed her by far but she was strong and feisty. When we were pre-teen age we had one nasty fight. It turned into an all out sister brawl. If I remember correctly we got to the point where she had me in a head lock. I must have been feeling concerned about where this fight was going because I scratched her hand...BAD. It looked awful. When the dust settled we looked at each other in terror. You see in our family hurting your sister was UNACCEPTABLE. Our folks fostered an environment where we were expected to be on the same team. We were to protect one another and treasure our relationships. When they found out we were going to be in BIG TROUBLE. So, we did the reasonable thing...we blamed it on the cat and never spoke of it again. Until many years later when we were safely grown up and our folks had no recourse. I've recently become intrigued by a tree near our farm…or is it two trees? I’m not a horticulturist so I really don’t know - I haven't inspected it below ground level (The neighbors would probably think I'm strange since it isn't my tree). This tree appears to actually be two trees that decided to work closely together. One trunk is sturdy and looks like it has been growing longer than the other; or maybe they started out at the same time and one was better suited to the ground from which it grew. For me, this tree is a beautiful depiction of marriage. Two people choosing to intertwine their lives, their assets, their very beings into one. They share the seasons and are sustained by the same soil and environment. Each season brings different challenges and joys, various struggles and growth. These trees will never be separated except by the death of one or both. This current season is cold and seemingly lifeless; and the trees, devoid of any evidence of actively growing, cling together and weather the season. I wonder what is happening during this dormant stage these trees go through each year...perhaps it is similar to times in marriage when things are less than fun, warm and friendly. When a couple is committed to God and to each other, there continues to be growth even when we can’t see it. Simply by staying together, something is happening…shared memories, resources, and relationships…things that shape a couple even when they are not aware. God is always at work conforming us in the image of Christ. I praise Him for the promise that He will not stop until the work is complete (Philippians 1:6)! For this reason I kneel before the Father, from whom every family[a] in heaven and on earth derives its name. I pray that out of his glorious riches he may strengthen you with power through his Spirit in your inner being, so that Christ may dwell in your hearts through faith. And I pray that you, being rooted and established in love, may have power, together with all the Lord’s holy people, to grasp how wide and long and high and deep is the love of Christ, and to know this love that surpasses knowledge—that you may be filled to the measure of all the fullness of God. The other day I was sitting next to my sister, Rock Star. I had my feet pulled up next to me on the couch. She looked at me and said, "Your feet stink!" Me: "Okay, yes they do." I moved them away from her and laughed my head off. I was instantly transported to my childhood. There are very few people in this world who can bust you out on stinky feet. Your sister is most definitely one of them. Me and my stinky feet love you Rock Star! I love my little Wubba so stinkin' much! 1. When I was in college I probably played various game systems around 20+ hours per week...I finished grand truismo (a very long race game). Upon graduating college my buddies back home didn't want to play HALO with me because I knew it like the back of my hand. I was an ace sniper. This is why I have not, nor never will have a gaming system in our house. I do not have an extra 40 hours per week to take away from my work, family, or sleep!!! 2. About a year ago Farm Chick and I got the first 5 seasons of the office and of an evening we would watch several episodes for our entertainment. The problem is that I CAN'T STOP WATCHING!! NO I MEAN IT...I LOSE SLEEP BECAUSE OF THIS! Recently we got the first season of Burn Notice (a spy show from USA that's terrific if you haven't seen it). Well I got it on a Friday and by the end of the following Monday evening we were DONE with the show...for those mathematically challenged folks...that's 12+ hours of fantastic sweet spy show screening! 3. We now are watching Big Bang theory and the sixth season of the office. Lord help us! 4. When I was planning my garden a couple of summers ago I spent all my evening hours with graph paper and gardening books arranging all the different vegetables and fruits in the perfect order. I probably spent over 100 hours just preparing to do something in that garden. I have an addictive personality...there are many more things that I could list, but it wouldn't be productive and I've already gotten my point across. Have a wonderful Sunday my friends! "Waste not, want not." I've heard the quote since I was small; though it isn't from scripture, it makes good sense. I've witnessed my folks, my grandparents, and other smart folks repurposing things all my life - whether it is restoring something, making it into something else, or passing it along to someone else who can use it, the example has never been wasteful. Pop and I recently graduated from our big, old, big, heavy, big, cumbersome (did I say big?) television to a flat panel TV mounted on the wall. Ahh...the floorspace we gained!! But what to do with the old tv armoire? Well...my old computer space was needing some help. The space was a bit junky and disorganized and always out in the open. So we repurposed both pieces and took the keyboard drawer glides and added them to one of the armoire shelves. Now I can have my keyboard AND my mouse at the same level! Go, Pop!! Strong work! We took off the back of the top piece that had been cut out to allow for the BIG tv, cut one of the shelves in half, added a light, sorted the stuff and put it in drawers all neat and organized and the old computer desk is in Pop's "red shed" awaiting it's new assignment there. Before Bubba was born I hit a bunch of garage sales. I was so excited to find sweet baby boy clothes for my new little man. I noticed a totally cute pair of red gap sweat pants at one garage sale. I scooped them up and bought them along with a bunch of other clothes. 1. Who embroiders their baby's pants with a family name? 2. How did I not notice it? Still, they are cute pants, all warm and snugly. So...Bubba wore them, then Wubba, then baby Q, who knows who else might one day wear these pants. So to the Johnsen Family, I say, "thanks for the pants!" When I was super pregnant with Wubba, Bubba got the flu. Then our washer pooped out on us. So, like any crazy hormonal woman would do, I grabbed my husband and marched right to the store. We purchased a top of the line front load washer and dryer. We spent a small fortune. I didn't care. I was about to give birth and my toddler was puking on everything. I was desperate. At first I was in love. It worked like a charm. Then just a few months into our ownership it started to show it's ugly side. Luckily we had purchased a one year service agreement so the repairs were covered for that year. We have had a lot of service calls that we paid out of pocket for since then. Well, last night, EJ and I were enjoying yet another episode of Burn Notice, when we heard what sounded like a power tool hard at work. At first we thought Pop and Grammy were working on a project downstairs. That seemed strange. It was late at night, the cowboys were sleeping and last thing we knew Pop and Grammy were watching TV downstairs. We jumped up to investigate only to find it was our washing machine. It was making some seriously crazy noises. Oh goody. Another repair man call. This morning I called for an appointment. I set it up for Monday. I was informed that the labor rate would be $129 + parts or I could pay a cool $344 for a year long maintenance agreement. When Grammy came up this morning for coffee, I told her my washing machine tale. I ranted about how much money this jewel of a washer had cost for the past 3 1/2 years. Then I told her I was going to buy a top loader and be done with it. Handy Grammy got that look in her eye. I know the look. It's the one that says, "I bet we can fix this." Next thing I knew she was searching on the Internet for ways to fix my model of washing machine. After some research she headed confidently to the washer, pulled back the rubber seal and dislodged one of EJ's dress socks from between the washer's drums. I have run two loads since and all is well in washing machine land. Handy Grammy, you rock my socks off! Or maybe EJ's. A few weeks ago an adoption professional came by the house to visit with us. We asked the boys to clean up their room before her visit. They were so excited about the whole thing that they did the task lickety-split. Right before she arrived, Bubba looked at me seriously and said, "Mom, don't tell her that we are super heroes." "Okay, sweetie, I'll keep that to myself." I answered. At a recent play date, I overheard Bubba announce to his friends that, "We don't have any clothes in our closet." It sounds like a sad tale but alas it is just another one of Mommy's attempts at organization. Grammy has always said that the laundry room should contain dressers for everyones' clothes. That way clothes go straight from the dryer to the dresser. I always thought that sounded a little weird. Fast forward a bunch of years, I now have 3 busy little men who all expect to wear clothes. I decided to to do 2 things. It is currently a pilot program but I think it is going very well. I don't feel so overwhelmed when it comes to putting up all their clothes. Also, I can better manage what comes out of the dressers. Anyone who has had pre-schoolers knows that emptying their dressers is considered an Olympic Sport. Even the coolest of gals want to blow their top when they see every last clothing item their child owns strewn on the floor of their closet/bedroom. I may have to move a set of these in for baby Q.